Orange trees (Citrus sinensis) are often grown as specimen trees. They provide showy, fragrant flowers in the spring followed by edible oranges in addition to evergreen foliage for shade. Orange trees are hardy in U.S. Department of Agriculture plant hardiness zones 9 to 11. Native soil rarely contains enough nutrients for these trees. They require nitrogen to set fruit, as well as other nutrients, which are often supplied with fertilizer. The fertilizer must be applied carefully, however, and at just the right time of year in order to supply these nutrients when the trees need them. Test the soil pH and nutrient levels to determine which fertilizer to use and if the tree can absorb nutrients efficiently. When the soil pH is too high or too low orange trees are unable to absorb the nutrients even when they are in the soil. The soil should be tested before and after planting orange trees. They grow in acidic to alkaline soil with a pH between 6 and 7.5, but do best when the soil pH is 6.5. Soil pH and nutrient test kits are available at most garden centers. There are digital meters available as well as soil sample kits. Test the soil at a depth of 4 inches. Soil in the top few inches often has a different pH from the soil deeper down closer to the orange tree roots. Mix sulfur into the top few inches of soil to lower the pH, if necessary, or lime to raise the pH. It can take months for the pH to change. It is best to apply the sulfur or lime in the fall but it can be done at any time. Test the soil again in two months. Make further adjustments at that time if needed. The amount of sulfur or lime required depends on soil type and how much the pH must be raised or lowed. For example, it will take 2.5 pounds of lime to raise the pH of 50 square feet of sandy soil from 5.5 to 6.5; it takes 4.25 pounds to make the same adjustment in loamy soil. To lower the pH of 50 square feet of sandy soil from 7.5 to 6.5, it will take 0.75 pounds of iron sulfate; making that same adjustment in loamy soil takes 1.5 pounds of iron sulfate. Test the soil for nutrient levels before selecting a fertilizer. The three numbers typically listed on the fertilizer bag represent nitrogen, phosphorous and potassium. Nitrogen is the first number, phosphorous is second and potassium is third. If the soil test indicates that nitrogen is low but phosphorous and potassium are at acceptable levels, use a fertilizer that supplies only nitrogen like ammonium sulfate fertilizer with a ratio of 21-0-0. When nitrogen levels are adequate but phosphorous and potassium are low, select a 0-4-4 or 0-3-3 fertilizer. Test the soil prior to applying fertilizer each time. Nutrient levels change throughout the year as the orange trees use them and they are leached out of the soil with water. Orange trees should be given fertilizer three times during the growing season: once at the beginning of spring when the trees begin to develop flower buds, again toward the end of spring and at mid-summer. In general, the beginning of April, beginning of June and beginning of August are good times for fertilizer application. Do not give orange trees fertilizer after the beginning of August. They will be going through a period of reduced growth in late fall and winter. Fertilizer given to them after the beginning of August will be wasted and possibly washed into waterways. Give young newly planted orange trees 2 tablespoons of nitrogen fertilizer with each application the first year, if the soil test indicates a deficiency. The amount of fertilizer given should be adjusted, based on the results of the soil test. Wait until after they recover from being transplanted and begin to grow. Increase the amount to 3 tablespoons at each application the second year after planting, and 4 tablespoons the third year. The amount of fertilizer given should be increased each year as the trees grow, if subsequent soil tests continue to indicate the need. By the time they are full grown or 20 to 30 feet tall, they should be getting 0.70 to 1 pounds of fertilizer with each application. 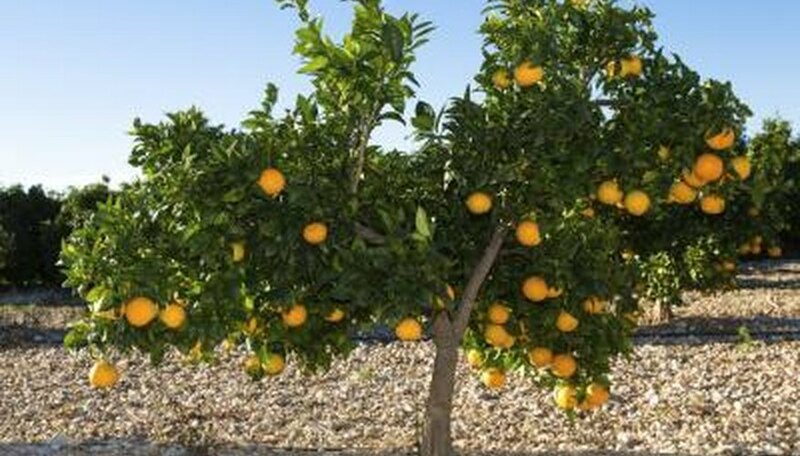 Sprinkle the fertilizer evenly on the soil around the orange trees beginning 6 inches to 2 feet away from their trunks, depending on the size of the tree, and extending out 2 to 3 feet beyond the drip lines, or outer edges of their canopies. This is where the majority of their roots are located. Water the fertilizer into the soil. Check the moisture saturation depth with a soil probe, which is a long, thin, metal rod. The soil probe will slide through moist soil easily but will require some effort when it hits dry soil. Water the orange trees until the soil is moist to a depth of 1 ½ to 3 feet, depending on the size of the trees.